﻿ File extensions. Useful information about opening different file types. FileSUPPORT.org website gathers information about file extensions and above all about applications connected with a given file type. You can use FileSUPPORT.org website when you look for an appropriate program to open a file with unknown extension. It is worth remembering that a file name is not only a name given by a user as it consists of two elements. The first one is a “base name” (the can be given by a user) and the second one is file extension. The particular attention should be paid to the second element because it is very important and it conveys a lot of information about a given file. File extension are signs appearing in its name after the last period (e.g. “.txt”, “.exe”, “.rmvb”, etc.). File extension is important information that tells a user what file type he is dealing with. Thanks to that, you know that a given file is for example text file, spreadsheet, film, etc. It enables you to choose an appropriate application that will be able to open and even edit a given file. 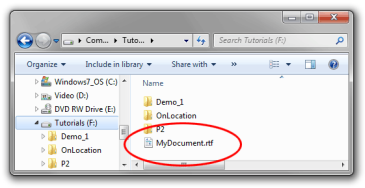 How to display file extension? 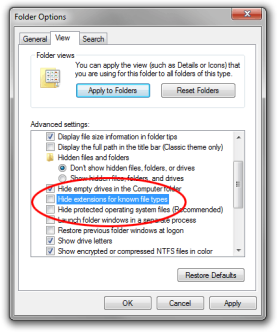 Often, the files seen in Windows Explorer’s window have only a “base name” without extensions. Fortunately, it is possible to display them. In order to display file extensions in newer systems such as Vista or 7 you should choose “Organize” button in an explorer’s window. Then you should choose “Folders and search options”, then “View”. If “Hide extensions of known file types” option is selected, deselect it and click OK. After doing it in explorer, full names with extensions will appear. Another possibility is to right-click a file and choose “Properties”. An informational window with extension of a given file, program, document, etc. will appear. However, methods described above are more convenient because all extensions can be seen without the necessity of performing the same activity for every individual file.